The University of West Florida broke ground today on University Park Center, a mixed-use facility adjacent to Pen Air Field, with an anticipated completion date of Spring 2018. 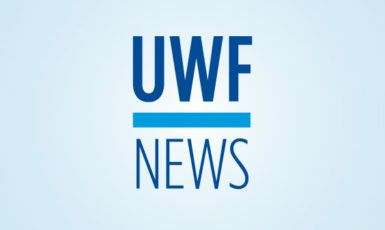 The 32,700-square-foot facility will provide additional space on campus for the UWF Department of Intercollegiate Athletics, as well as office space and meeting rooms for the UWF College of Health and the Florida State University College of Medicine’s Pensacola Regional Medical School Campus. The first floor will house a state-of-the-art weight room for all UWF student-athletes as well as a football locker room, equipment room and laundry facilities. The second floor will include office suites for the UWF College of Health and FSU College of Medicine, as well as a shared multipurpose room. The second-floor space is being developed to provide a location for campus and community partners to access UWF College of Health leadership and a base for operations for the FSU College of Medicine’s Pensacola Regional Campus for third- and fourth-year medical students. The space will foster more integration across the two universities through the UWF/FSU Physician Assistant Partnership Program. The UWF Center for Interprofessional Collaboration in Health Education, Research and Practice will be included in the College of Health suite on the second floor, featuring workspace and a compilation of all projects and scholarly activities within the College. Multiple health disciplines will be represented in the administrative suite, including medicine, physician assistant, nursing, public health, medical laboratory sciences, health sciences and administration, psychology, athletic training, exercise science, community health education, fitness and conditioning, and physical therapy. The second floor will also include the College of Health dean’s office. The athletic facilities on the first floor of University Park Center will provide additional space for the UWF football team, which is currently competing in its first season in Fall 2016. Football offices and operations are currently housed in temporary facilities adjacent to the UWF Field House. University Park Center is budgeted at $6.8 million, with Caldwell Associates Architects Inc. of Pensacola overseeing the design and Childers’ Construction Inc. of Tallahassee serving as the construction manager at risk. The building is planned to be LEED certified by the U.S. Green Building Council. The University Park Center groundbreaking marks the beginning of the second phase of the development for University Park. The first phase was completed in February 2016 and included 12 acres of site work, associated utility infrastructure, lighting and the construction of a synthetic turf field which was named Pen Air Field on Sept. 7, 2016. To learn more about University Park, visit uwf.edu/universitypark.